Alusiman – Scientific name: Portulaca olearacea L.
Portulaca, common name for a family of plants in the pink order, comprising a small, widespread group of more or less succulent herbs and subshrubs, with concentrations of species along the Pacific coast of North America and in southern Africa, and for its representative genus. About 21 genera and 400 species make up this family. The leaves are opposite or alternate and bear stipules (appendages, usually leaf-like, at the leaf base) that are often modified into membranous scales or hairs. The usually small flowers characteristically have only two green sepals, four to six petals and stamens, and a single ovary borne above and free from the other floral parts. 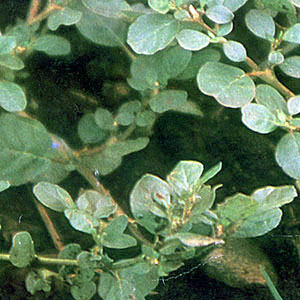 The common purslane has long been used as a pot-herb and in salads. Several other species are used as ornamentals. Scientific classification: Portulaca plants make up the family Portulacaceae. The representative genus is Portulaca. The common purslane is classified as Portulaca oleracea. This entry was posted in List of Medicinal Plants in the Philippines and tagged Alusiman on March 5, 2009 by Pinoy Herbs. saan ba ako makabili ng purslane sa manila? I AM LOOKING FOR THE AUSTRALIAN MEDICINAL PLAND COMMOM NAME (I THINK ) IS SIDATUSA, MY BE SPELT WRONG.